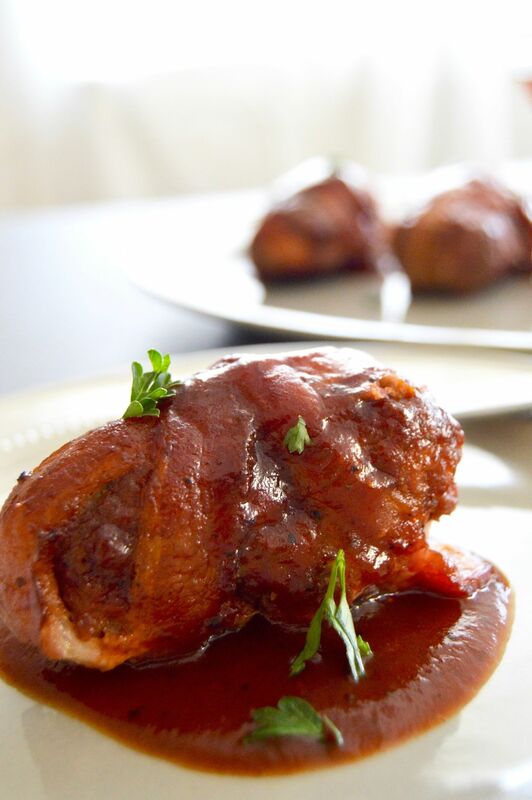 Hearty bacon Meatloaf Appetizer Bundles: Crispy bacon wrapped around meatloaf bundles, brushed with bbq sauce for a filling and comfort food appetizer! Ideal for the holiday party season because they are filling and delicious! 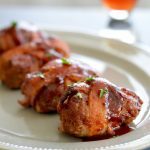 Hearty Bacon Meatloaf Appetizer Bundles are a great appetizer for all of your cocktail party needs! 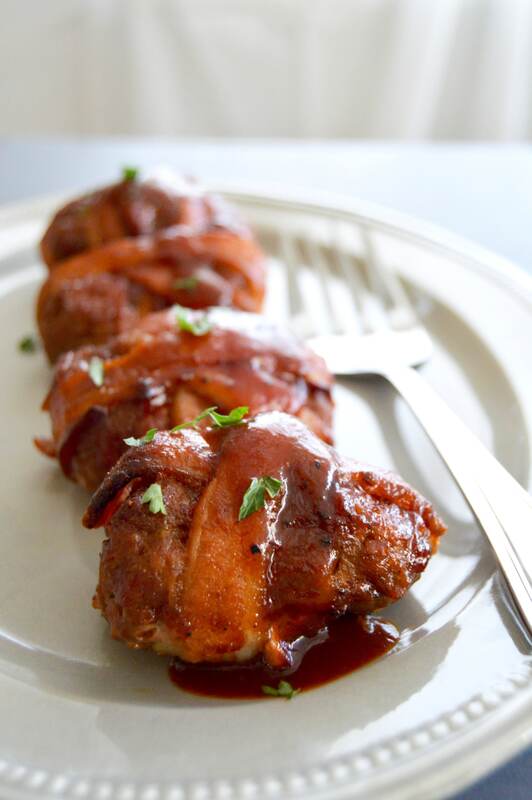 They are brushed tangy bbq sauce, wrapped with bacon…. all of that deliciousness around tender juicy meatloaf. They are an ideal choice for entertaining! You only need serve one appetizer to your guests with these as they are filling and satisfying. Entertaining for the holidays need not be a lot of work. You can make one easy show stopping recipe that your guests will enjoy and then have just a few nibbles such as these easy marinated olives from Take Two Tapas (or just pick our your favorite from your local grocery stores olive bar.). The benefit of making one appetizer like these Hearty Bacon Meatloaf Appetizer Bundles is that the other nibbles don’t have to be anything fancy. Your guests get one amazing appetizer that fills them up and they go home happy! The other offerings can be storebought. — it looks like you did a lot of cooking when in essence you only had to arrange them nicely for serving! Easy/Hard: Easy to mix together the meatballs and wrap them. 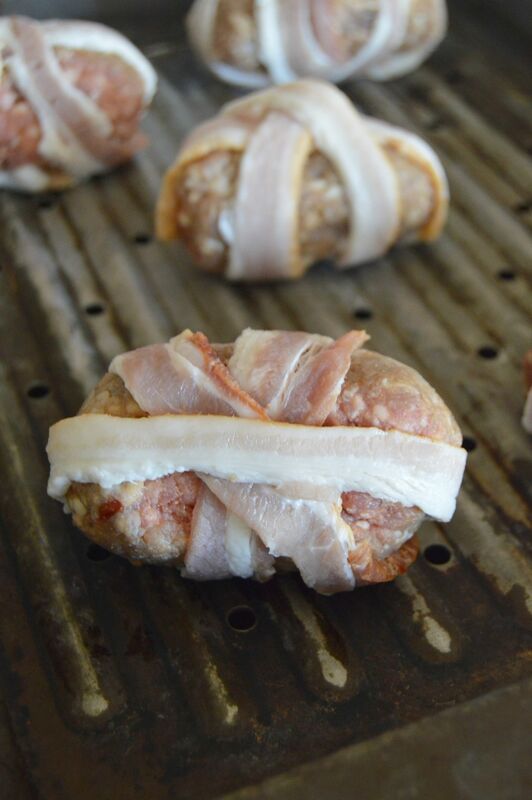 Heres a simple way to make sure you have bacon in each bite by wrapping in cross pattern. Make ahead? Yes! You can make the bundles ahead up until the point of the picture up above, the meatloaf bundle is formed and the bacon wrapped around them. This way you can not have anything to do when your guests are in your home. Pair with: These go well with a red wine like a granache which is often very fruity. A Merlot works well if you have an extra spicy BBQ sauce. Looking for other hearty appetizers? 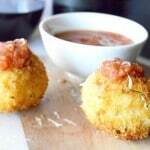 Check out the Ruths Chris Copy Cat BBQ shrimp recipe here or these Gruyere Salami Arancini (risotto balls) here. 1/2 cup BBQ Sauce I use Famous Dave's Devils Spit, but use your family favorite! Using a wooden spoon or your hands in a large bowl mix together beef, pork, heavy cream, beaten egg, salt, oregano, panko bread crumbs and parmesan cheese. Do not pack the meat too tightly, you want to use a lighter touch so that the meatloaf bundle does not get too compacted allowing for a lighter moist (versus heavy, hard) final product meatloaf. Cut the bacon in half width wise. Then cut it in half length wise. You will end up with four strips from each piece of bacon. Use 3 strips on each bundle of bacon. Make sure the ends of the bacon end up on the bottom so that when they bake they are held in place. If you are making these ahead, you can place these in the fridge and cover with plastic until 1 hour before you are ready to bake them. Place bundle on a baking sheet and bake at 350 for 25 mins. Remove from the oven and increase the temp to 400° Baste the bundle with bbq sauce and put back into the oven for 5-10 minutes carefully watching to make sure they don't burn. Every oven is different, but you are crisping the bacon and caramelizing the bbq sauce. Remove from the oven, baste one additional time before serving. Serve with additional bbq sauce as a dipping sauce. Cooking time does not include rest time in fridge for 1 hour to set. I don’t think there is a more comforting appetizer out there than these little bundles of goodness! I could eat them everyday! Oh, my! These look so delicious! Love that you added tips and pairing recommendations, too! I know you said these are appetizers, but I would totally have this for dinner, too! YUM! These look absolutely delicious and addictive! What a great appetizer!! Already pinned and making them soon! What an awesome idea for an appetizer! So simple but looks incredible! Plus they look so pretty! Wow, I bet people go crazy for these at parties! I have a vision of serving them with some kind of mashed potato dollop. Incredible! 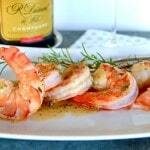 Omg love these Michele, this is my kinda appetizer they sound absolutely delicious! How cute are these little bundles. Anything with bacon on is going to be popular at a party. Yummy! These look so good and I love how well they present too. I am going to have to try these. Thanks Luci! I hope you enjoy them!